Calendula & Concrete: Zucchini fritters are a hit! Zucchini fritters are a hit! And so begins the challenge of learning how to cook gobs of zucchini. I picked #2 and #3 from the garden on Thursday, along with a good handful of French tarragon, parsley, and cilantro. 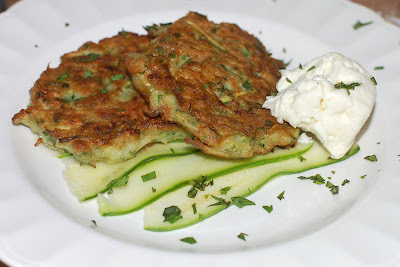 I turned to this recipe for basic instructions on how to make zucchini fritters. Since I didn't have all the exact ingredients on hand, I changed course by adding more tarragon (and the cilantro) to make up for a limited supply of parsley. I also used plain bread crumbs in place of the Parmesan cheese. The mixture of shredded zucchini with flour, baking powder, nutmeg, and egg made a very wet, gooey batter, but it formed nicely into patties once it hit the sizzling pan. I loved these! They were light and had a wonderful fragrance from the tarragon. In fact, I think it was the combination of tarragon and nutmeg that put these over the top for me. Plus, they were fried and... who doesn't like their vegetables fried? The only downside was that they were a little soft in the center; more than I would have liked. Next time I would probably make them thinner (and add the Parmesan cheese, as the recipe called for), but otherwise, I am now a fan of zucchini fritters. I ate them with feta cheese on the side. Fantastic. I may try that recipe. I'm going to have a lot of zucchini soon, and am already starting to harvest a variety called Cue Ball, which is round. Any ideas for using those? Those look delicious! There's something eminently satisfying about shredding zucchini, to my mind - I will have to try these. Wow -- they look DELISH! sounds great! I'll try it, when I get some zucchini!! I'm just going to go over here so the drool doesn't get all over your nice neat site! Something you might try, Christa, is frying the fritters in the pan, then placing them in the oven at, say, 325 or 350 degrees to finish cooking so they are cooked through the middle. 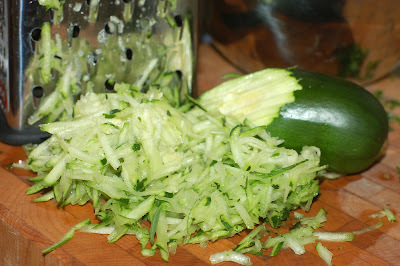 Also like Zucchini carpacio a lot, which is very thinly sliced--even lengthwise with a vegetable peeler--then dressed as you like with crumbled cheese and herbs. Can't wait to test these out . . . thanks so much for the link to the recipe (in the older post). Christa: That's a great link! I just downloaded several recipes. Thanks for that and the great pictures. Now I am hungry! What time is dinner! 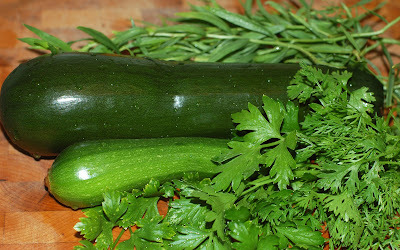 I saw this recipe for stuffed eight- ball zucchini on FatFree Vegan Kitchen. Tons of great recipes over there! I love your idea of trying panko bread crumbs. I've never used them before but would love to give them a try. Good idea. I did keep some of them warm in the over while I finished cooking the whole batch, but I didn't have the heat cranked high enough to really keep them cooking. Will try next time. Good luck with your zucchini. Let me know if you decide to try this. Glad you found the link useful. I just found that site recently. Many of the recipes sound delicious, don't they? Sounds good! I will have to give this recipe a try. I love when gardeners put up recipes. I think gardening gives one an appreciation for good food (and an occasion to use the veggies we grow, of course!). Keep up the fine cooking! That's making me hungry... when will my zucchini be ready... I think I saw little ones and those grow like mushrooms, don't they? Yum! I'm jealous - it's so wet and cold here in the UK this summer that I've only picked 3 courgettes so far. Pitiful! 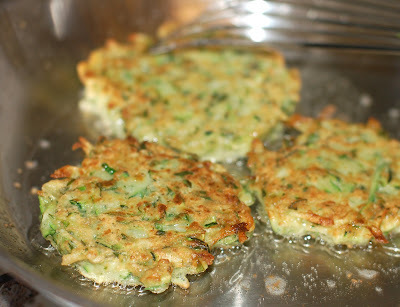 Thanks for linking to my recipe for zucchini fritters, so glad you tried them! You fritters came out GORGEOUS. Your post reminds me of my granny’s garden - I really miss it!